After a long, cold winter people aren’t the only ones who are ready for Spring! Termite swarmers typically emerge from their larger colonies between the months of March and June. After a termite colony reaches a certain size, members of the colonies branch out to expand. The warmer weather and wet environments of spring lures the termites away from the group and encourages them to reproduce. The result is what we call swarmers, winged termites who fly out to seek a mate, fall onto the soil, shed their wings, then attempt to start a brand new colony in the conducive spring weather. While most new colonies do not take, swarmers do indicate that an active termite colony is close by. 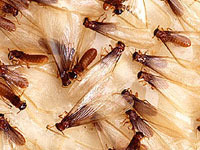 If the spring weather brings swarmers to your home, call Eastern Termite for an assessment.